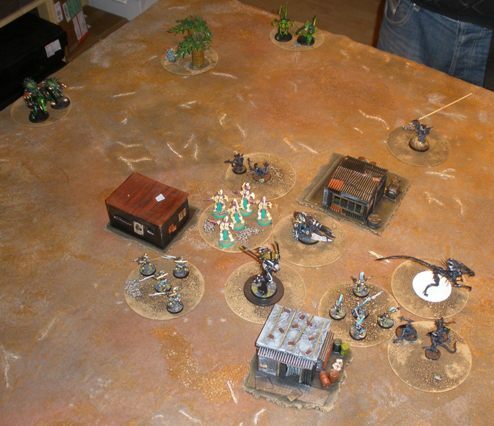 I got a quick mid-week game in with COM last Wednesday, so we played the “Surrounded” mission. 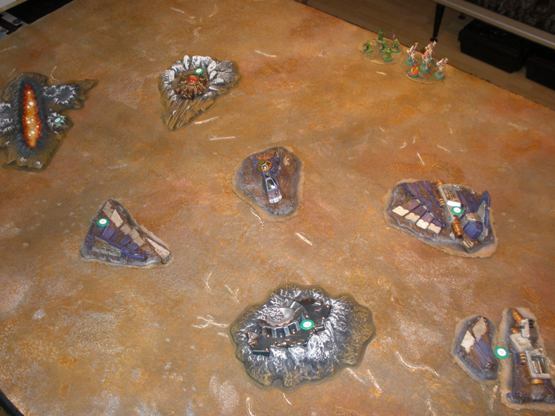 The Marines/Eldar set up in the middle of a 4×4′ table with a larger force of bugs equally divided on the four table edges. The Marines/Eldar also got an emplaced weapon as part of the scenario set up but I forgot to put it on the table before the above photo was taken. It features in the later snaps (for all the good that it did). The emplacement is still missing and the Alien queen really should have her base painted: it looks awful. 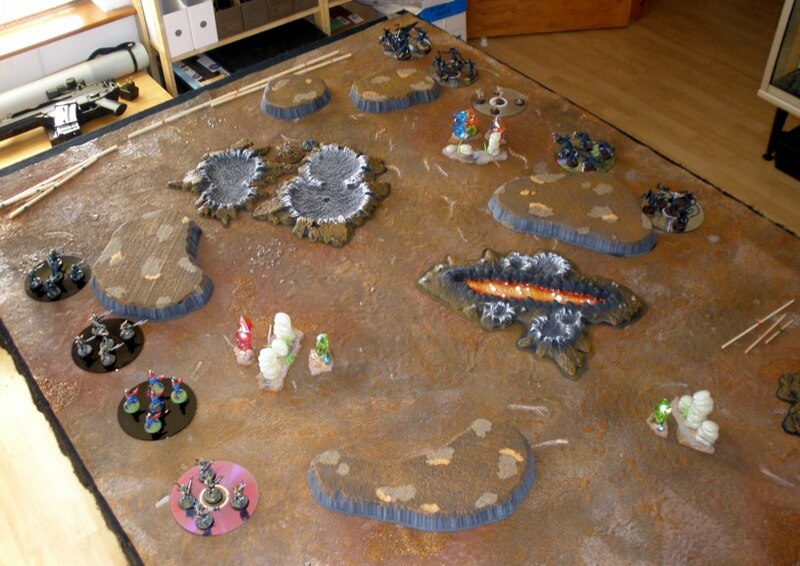 The scenario specified the 4×4′ battlefield. Therefore the bugs were able to close quite rapidly. Some decent reaction fire from the marines whittled their numbers down a bit, but a run of poor activation rolls meant that the marines became bug chow pretty fast. The Alien queen (with the embarrassingly unfinished base) flinches a little from incoming fire while the mauled xenomorphs prepare to slice up the eldar guardians. The marine units got to fire a couple of times, but recurring activation problems meant that a lot of bug units had an easy time getting in close. “Tough” units (such as the “Colossal” trygon above) are particularly hard to dent in this system. The marine power armour troops (represented by wraithguard) are very hard to shift when using rank and file bugs. As such they tend to be a must-have unit in games, even though they are pricey. In this game the Power Armour troopers again showed their worth by hanging around for longer than any other marine unit. I set up the marines in a silly fashion. I should have concentrated them a bit more on one side or the other in the hope that they could take advantage of numbers to squish the bugs piecemeal. 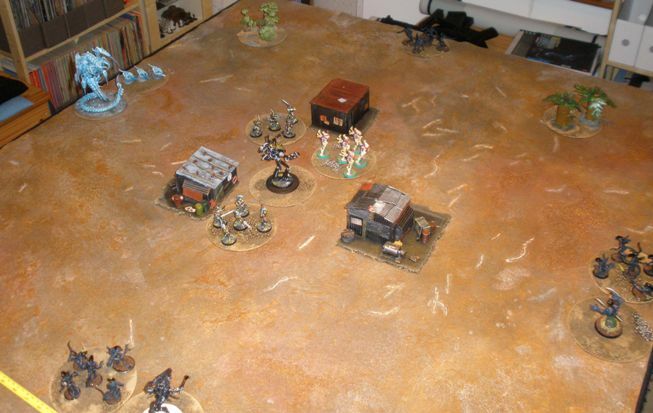 Memories of a previous game where the marines set up so close that they got over run in quick succession meant that I spread my troops out in an ineffectual fashion. They paid for my poor generalship with their tiny metal and plastic lives. This game wasnt a drag or anything and it played out very quickly, but it ended up being a bit of a dice fest rather than a narrative generating battle like the Save the Miners game last week. In Swatters the bugs can move very fast and forcing the marines to set up less than two feet away makes some of the engagement a forgone conclusion, which is a bit unsatisfying. The activation system can always throw a spanner into plans of course (a good thing as it encourages maneuvering and gives more chance for narrative and the like) but I think that I would like to try this scenario out another time with the bugs coming in from either end of a 6′ table instead: I think that it could be more fun that way. MT and COM came around last week to help me do some more Swatters playtesting, continuing our progression through all of the scenarios in the rulebook. It was also an opportunity to use the thirty CDs that I had textured since the last session. I wouldnt say that I was excited about using the CDs, but I was pleased to have got them finished and ready to go this time, as they look a lot better than the shiny CD surfaces visible last time. Nerdcore. MT has a medium sized Tyranid force from years ago that we figured would be fun to get on the table again alongside the blueish-white tyranids that COM currently has custody of. My modest bug collection also featured. Between the three forces we were easily able to represent any unit from the bug force list. None of us have a suitable painted force of Colonial Marine or Mobile Infantry or even Imperial Guard so a mix of Eldar from both MTs collection and mine performed that role. Space elves have to fumigate their real estate from time to time too I suppose. The first game played (shown in the photos above) was a simple, non-scenario affair to refresh MT on the core Ganesha rules, plus show him how the new elements in Swatters work. The next scenario was “Save the Miners” and its started off looking like as it does above. 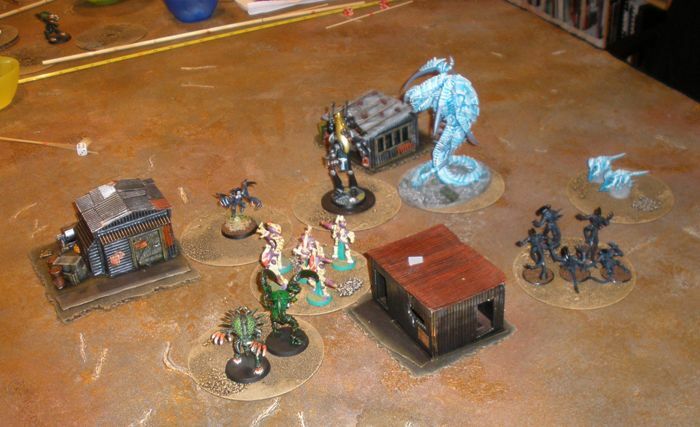 Note the mineshaft in the middle of the table and the three units of miners (Necromunda Goliaths plus two EM4 miniatures painted by Mattias, the male and female models bookending the group in this shot) in contact with the buildings. 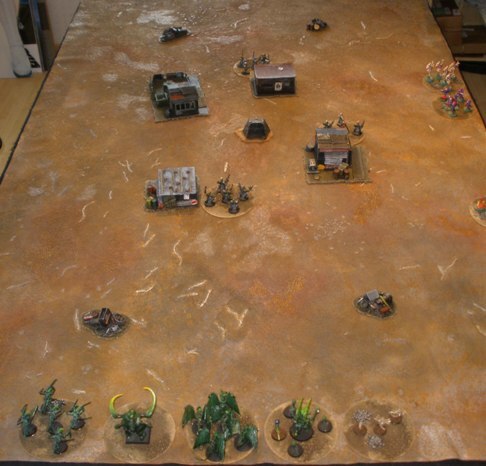 The Marine forces are set up across one long table edge and the bugs come in hell bent on doing some property damage and eating some miners (who look a bit chewy to me) from either/both short edges,. The bugs (played by MT) surged across the table in a series of very good activation rolls. The first unit of miners barely knew that they were under attack before they were devoured. 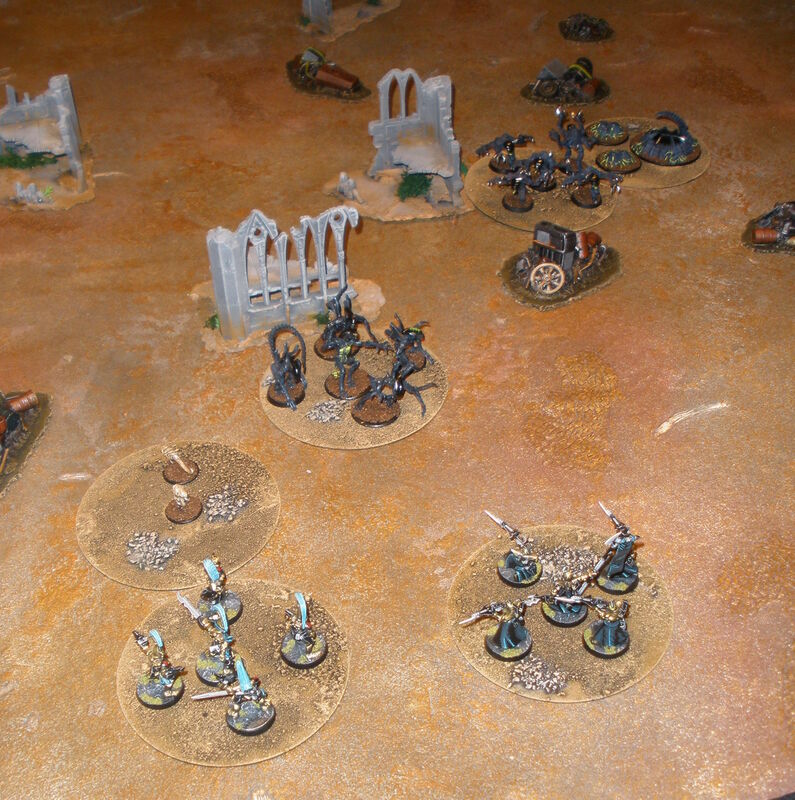 Tough bug reinforcements came in from the opposite side of the battlefield while the Eldar slowly advanced into the mining town, which was beginning to blaze with biochemical fires. The bugs break through the marine lines and mug another group of miners against the backdrop of the blazing town. Its looking dodgy for the good guys. 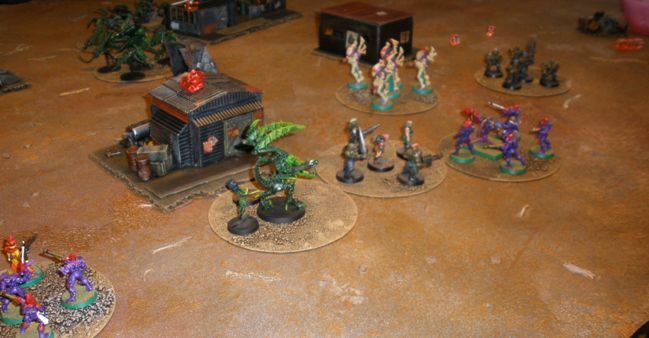 The big, tough bug reinforcements (the raveners on the right) are held at bay by a heavy weapon blast from marines that would have pulped any other bug unit. Unfortunately for the marines, while the bugs are halted just before they could destroy the red roofed building, the offenders are suppressed rather than swatted. The tide turned at this point and the power armoured troops (the wraithguard) mopped up the various non-tough bug units, but it was touch and go for quite a while, which made it a fun game overall. Probably the most entertaining Swatters game to date. I think that I prefer Swatters games on a 6×4′ to those on a 4×4′ as it allows the Marines to get a round or two of shooting in before the bugs get too close and gives an opportunity to watch a seething horde of monsters run the gauntlet, Starship Troopers style. The next game involved Eldar/Marines (MT) searching through crashed spaceship wreckage while under the threat of secretly concealed bugs (me). Less like the do-or-die battle from the end of a movie, unfotunately this game played out like the bit at the start of the film before the credits, ending in wet slicing noises and screaming. The bugs leapt out of the nearest piece of wreckage, accelerated towards the marines and killed them. Game over man. As that scenario had played very quickly we decided to try it again, with the marines set up in a way that would allow them to provide mutual support when ambushed, rather than just get in each others way. We also forced the bugs to spawn in smaller numbers from around the battlefield rather than allowing them to all show up in a single spot. I also dropped Alexis from the team and fielded a pair of Colossus (COMs blue/white carnifexes, or “carnifaeces” as someone christened them last weekend), just because the models are cool and in order to get a grasp on how their rules worked. The next Swatters playtest was with COM yesterday evening. I will do a quick write up on that as soon as I can manage it. Inspired by what Mikko at dawnofthelead has been doing with his “Utopia” campaign, last week I contacted Ganesha Games to find out when their dedicated bug-hunt rule set “Swatters” was due to be released. Ganesha told me that the rules were close to finished but required some further playtesting. I volunteered to get involved in the process as it sounded like fun and had a playtest copy of the rules within a day or so. 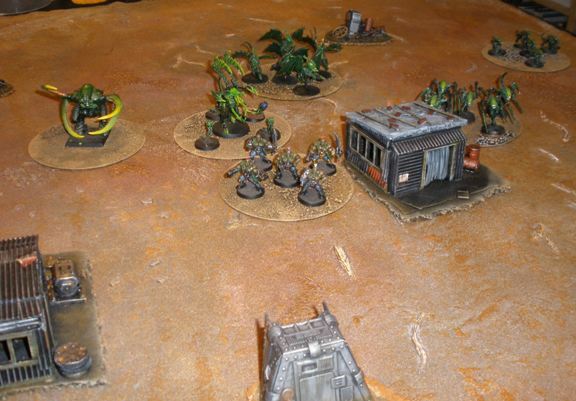 COM and TM were available to get involved in a couple of games last Saturday, so my bugs were unearthed and reinforced by some xenos from COMs hive. 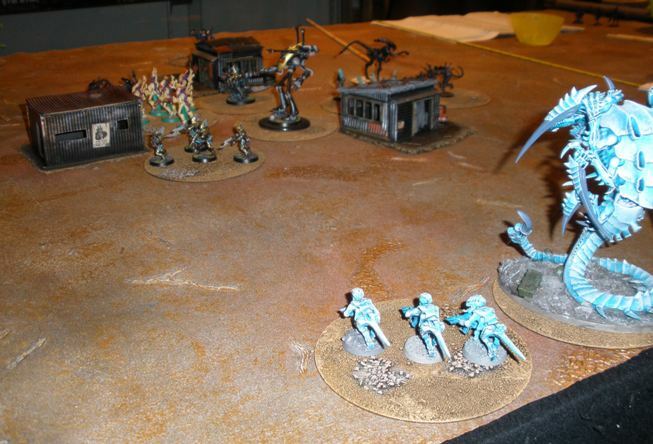 My Iacon Eldar did their best Colonial Marine impersonations and we got a couple of games played. The first game that we played (shown in the photos above and below) was the standard Meeting Engagement scenario using forces of about 1100pts each on a 6×4′ table. Swatters is a squad based battle game rather than the skirmish sized games that Ganesha is known for. Being a Ganesha game Swatters is a lot more streamlined than many similar games, which appeals to me a lot. 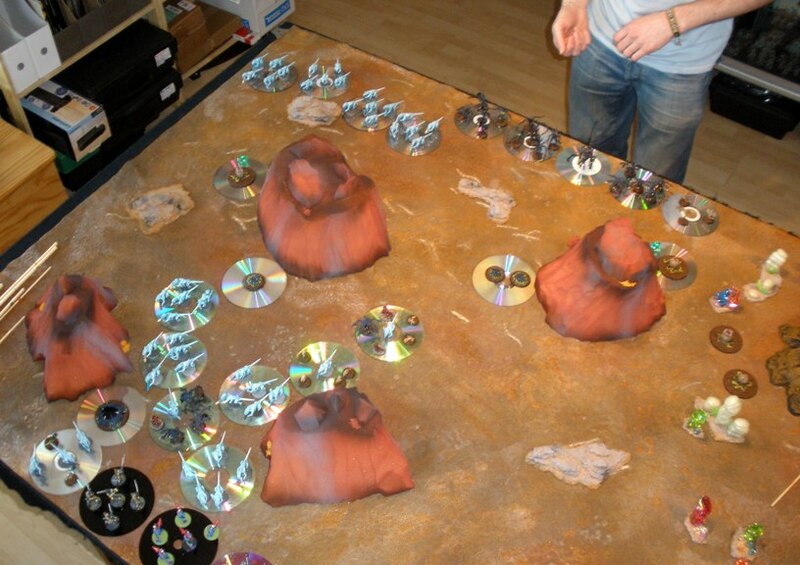 One aspect of the rules is that five man/bug squads, objectives, spawn points etc are all arranged on individual CDs for numerous reasons, both in terms of game mechanics and for simplicity when it comes to moving large numbers of figures around. 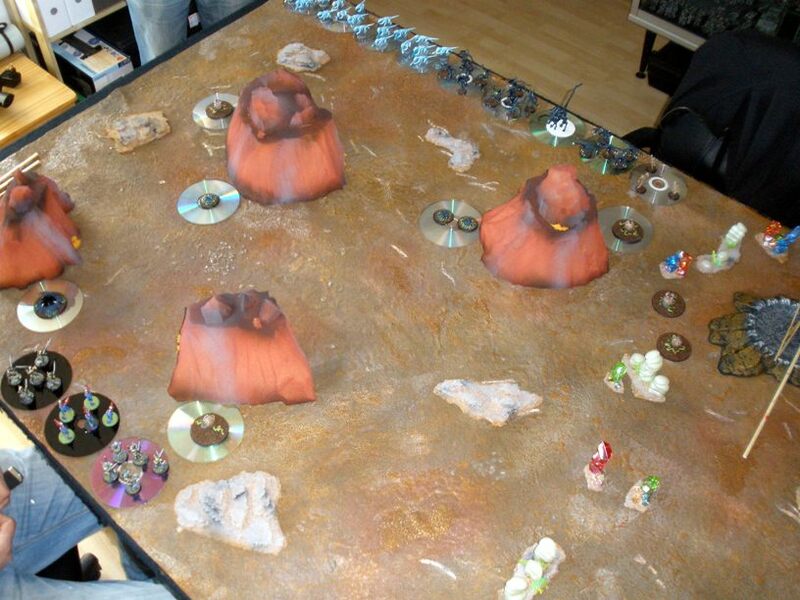 As I only had a little lead up time to this game I didnt get around to texturing the CDs to match the table before the game, so the photos are a bit uglier than usual. The next playtest session (planned for next weekend with MT (not to be confused with TM)) will take place using properly textured CD bases with a bit of luck. I played Meeting Engagement with TM. 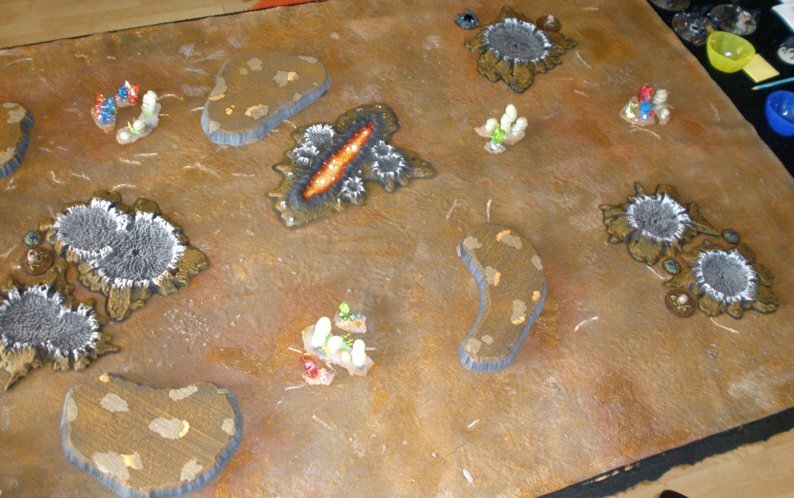 I set up the terrain according to the rules in the scenario, but couldnt help but add a few more bits of terrain, as it seemed a little too open. As it happened the bugs got wiped out before they even made contact with the Eldar, although not all of that was due to the open terrain. It was TMs first Ganesha game and he picked up the basics fast so the game only took about an hour or so. 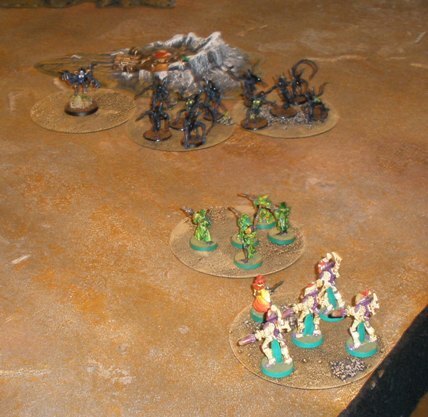 In “Space Demon Omelettes” ten units of bugs line up opposite three units of Eldar (marines). The other CDs scattered around the table are either Spawn points or Egg markers. Despite the fact that I used painted models for the spawn and egg markers the reflective surfaces on the CDs look awful. They will be covered up by the next game. The next scenario that was played was “Space Demon Omelettes”, with TM playing the bugs again and COM playing his first Ganesha game as the Eldar/Humans. The scenario involves a raid on a 4×4′ bug nest to smash up some eggs. The bugs have access to a lot of cheap drones that are absolutely terrible in combat, but numerous. Bugs on the baseline. This photo would look significantly cooler if the CDs were camouflaged a bit. Each side has a dice pool in Swatters that can be used to either buff shooting (for the marine side) or close combat (for the bugs). 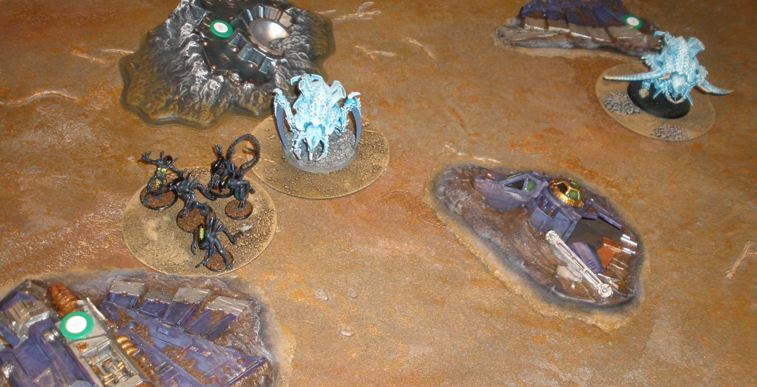 The bugs can also use dice to generate reinforcements that spawn either on their table edge or at areas specified by the scenario. From what I have seen so far the reinforcements for a standard game will amount to roughly one base of pretty decent troops per game. In this game however the reinforcements were limited to the very poor Drone troop type, although TM did generate quite a number of them right in the marines faces, as seen below. 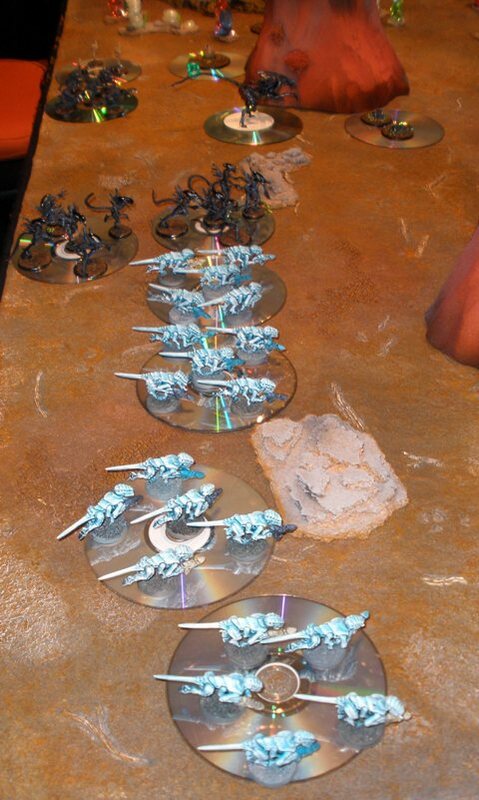 Eight bases of drones (the blueish Termagants) emerge from the spawn points in the first turn of the game. Given the option to use the dice to buff attacks or to generate more figures TM went with the more figures option, as he had done in the first game too. I find it hard to imagine a game where I wouldnt go for the reinforcements in preference to be honest, although in this scenario the drones generate more easily than regular reinforcements do, so its definitely the way to go for Space Demon Omelettes I reckon. A few more games will have to be played to see if I think that the bug close combat buffs are worth it or not. 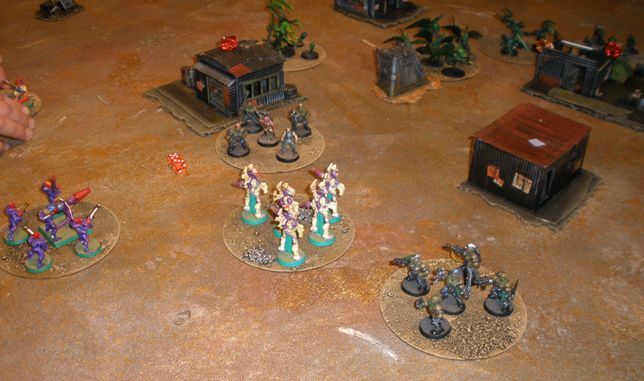 At this point we figured that the marines (the three units on the dark CDs in the photo above) were in trouble. Despite one of the units being comprised of nasty “Power Armour” troops (the Dire Avengers with the retro paint jobs in the middle) we figured that they might not have been able to bring their strengths to bear. We neednt have worried. A quick look at the rules for drones showed us that they are absolutely woeful and COM spent the next few turns killing forty of them for the loss of one marine. The only problem with it being open season on drones was that the significantly more dangerous Queen and her entourage were closing in. In the end the drones did their job by dying in droves while engaged with the marines while the more dangerous bugs came up behind them. The Marines gave decent account of themselves but once the properly scary bugs hit them they fell apart. 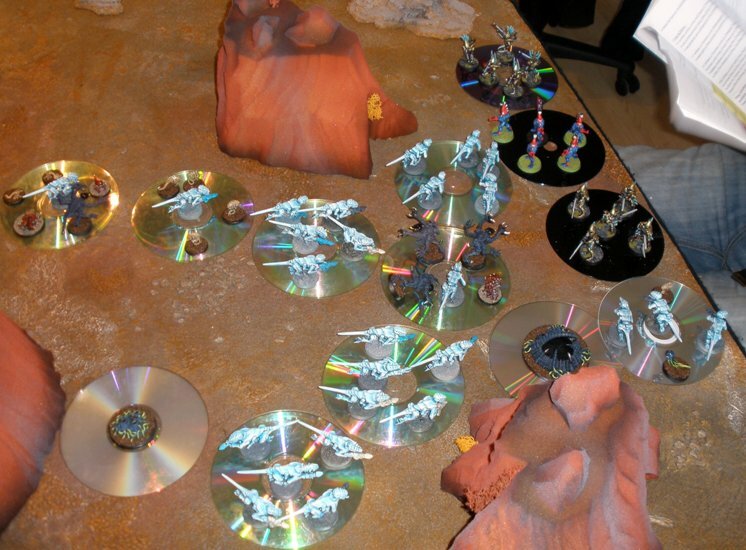 It was a fun game, marred visually by the big ugly CDs. I enjoyed played a game with a higher figure count for a change and bug hunts have a lot of appeal to any Aliens fan of my vintage. 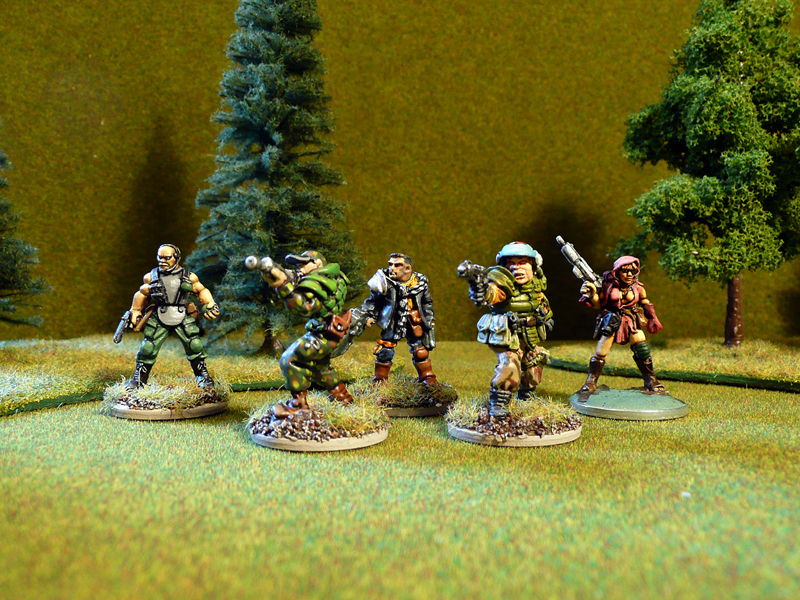 A couple of the game mechanics regarding the basing of the figures worked quite well. I am looking forward to trying out some different units and putting the rules through their paces further next weekend with MT. The CDs will be less ugly next time too. 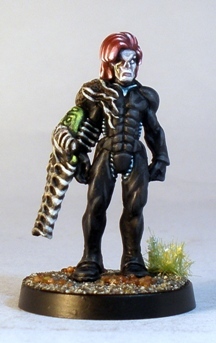 Todays figure from the vaults is the leader of the Eldar army that I painted in 2002, the Eldar from the Iacon fleet. 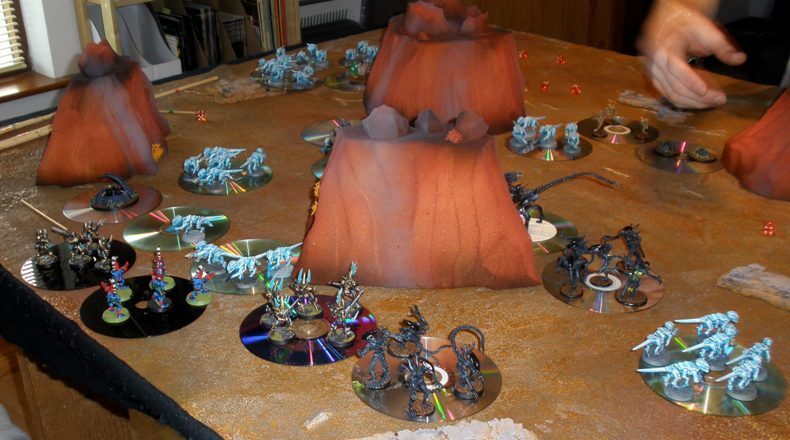 The army was made from GW parts from a variety of sources but mainly from a mix of Eldar and Dark Eldar parts. 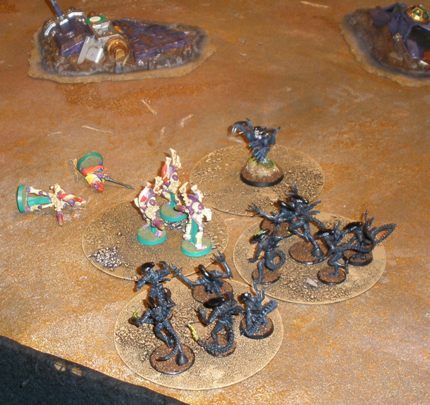 At the time I played using the army chosen from a Craftworld Eldar list, but I wanted to be able to field the figures as Dark Eldar if desired too, even though I never did in the end. The background for the army plonked the Iaconian Eldar somewhere between the Craftworld Eldar and the Dark Eldar in philosophy. The idea was that rather than base themselves in a craftworld after The Fall, that the Iacon fleet had assembled for safety in numbers. As a result the fleet contained ships of many sizes along with occupants with their own agendas. Obviously this was loosely based on the concept of Battlestar Galactica, although the remake wasnt around at the time. Another influence was a vaguely Egyptian theme, mostly added so that I could tie the figures to some cheesy decorations that I had been collecting with a magazine around then (visible in a game here). It also helped to focus me on some of the visual elements of the army such as colour and some of the decoration. Everyone is familiar with the concept of “Space Egypt” anyway due to Stargate. Funnily enough I didnt like the Stargate show (because it is shite), although the look of the tech in the movie was cool. Yuminor above is assembled exclusively from plastic parts: Dark Eldar and Craftworld Eldar jetbikes, High Elf arms, a modified pair of High Elf spears, Dark Elf torso and helmet, a bit from a Falcon grav tank, some old shuriken catapults, some styrene strips and a Bretonnian helmet crest. I think that the cape is High Elf too, but it might be from a Chaos Warrior, I cant remember. The circular thing stuck to the back of Yuminors head is a part of a Falcon kit. It is supposed to tie in with circular gold Egyptian decorative elements that were used to venerate Ra, representing the sun. The piece of plastic that I used was just a bit too thick and so looks a little odd (or maybe just a little bit foreign and alien if I am feeling charitable). Just about visible in the shot above and easier to see in the photo above it is the hand painted glyph in the side of the canopy. 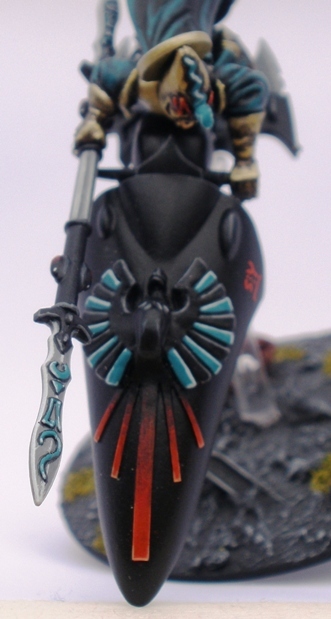 Each unit in the army has their own unique glyph inspired by both the existing Eldar look and Egyptian heiroglyphs. Obviously they dont mean something specific or anything like that but they do give a nice element of detail on the figures, Yuminor included. I find that one area on a miniature brought to fine detail like that can help to give a sense of scale to figures. When it works the figures start to look a little less toy-like and just a little more real (as far as space elf sorcerers on jetbikes look real, but you know what I mean). Another element that I carried through the larger models in the army was a phoenix-y bird type motif. The main reason that I did that was because there was a suitable crest on the High Elf sprues that I had in sufficient numbers to put on all of the vehicles that I had planned for the army. 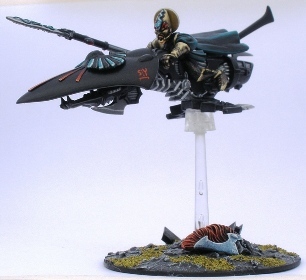 The bird on the jetbike canopy above however is a Bretonnian knghts helmet crest with some styrene strips making a sort of tail. That shot also shows the High Elf Spear which I made double ended because I think that it looks good like that. It also looks a bit like Prince Nuadas spear from Hellboy II now that I look at it. That cant be a bad thing. I like this model a lot even though as I mentioned in a previous Iacon post the paint scheme was laborious in its execution. Still, Yuminor (name inspired by a character from the super cool Ulysses 31 cartoon) is one of my better examples of a unique figure used to represent an army leader. Yuminors career didnt have the same gaming span as my Nurgle Chaos Lord but he still stands as one of the better examples from my own corner of the hobby.